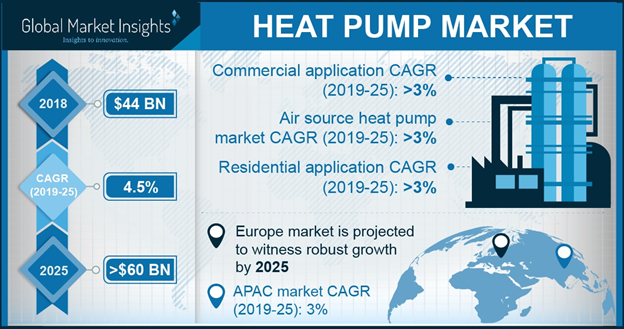 Heat Pump Market size is set to reach over USD 60 Billion by 2025, as reported in the latest study by Global Market Insights, Inc.
China heat pump market size is projected to grow over 2% by 2025. Government mandates to reduce carbon footprints by promoting the utilization of renewable energy mix will provide stimulus growth across the nation. For instance, in 2018, China National Development & Reform Commission introduced policy to increase renewable energy targets from 20% to 35% by 2030.